General information about paragliding training. After reading the General information page, decide if you would prefer free flight (PG) or powered flight (PPG). You can change your mind later if you want. If in doubt, it is always better to start with free flight. Equipment for flying Typical setups for paragliding and powered paragliding. Tuition includes the rental of all equipment required to train up to the P2/PPG2 level. We suggest that you purchase your glider (and paramotor) towards the end of your P2/PPG2 training. We can help you purchase the gear that works best for you. We specialize in Ozone paragliders/harnesses and paramotors by Miniplane. Tuition Costs Paragliding (PG) Powered Paragliding (PPG) You must pay your tuition in full before we can schedule for training. Tuition is not refundable (see #3 of our legal details). Membership All student pilots must join either USHPA or USPPA before P2/PPG2 training begins. If your application is pending, we need a copy of your completed application. You can also complete the application at our shop. Textbook Purchase the appropriate textbook for your type of training (P2 or PPG2 and above). FAQs & Tips Study the "*" items. Watch the training videos. Legal and operational details These are the important details of how we operate including the legal waivers you must agree to. Schedule a meeting After you have looked at #'s 1-8, contact us to schedule a meeting at our shop where you can complete the paperwork, pay your tuition, and start your paragliding adventure. Flight school is conducted at the Evergreen Turf farms. Ground school is at our shop. USPHA (free flight) supplements ground school with an online curriculum for the convenience of student pilots. Generally, we schedule flight school during weekends and holidays, weather permitting. However, we can also schedule at other times when the student is available. WARNING: Do not purchase paragliding equipment before you begin training as you will likely make an expensive and, possibly, dangerous mistake. We can continue training pilots from other schools who purchased their glider from that school. Otherwise, you must train with whomever sold you your equipment. If you think formal training might be a waste of time and money, take a look at this page and this one. Flying along the White Mountains, Owens Valley, CA. It does not get better than this! As a PASA certified school, Southwest Airsports, LLC operates in accordance with all PASA safety guidelines and school standards. Instruction at Southwest Airsports is 100% personal, comprehensive and includes towing certification and how to fly in a high altitude, mountainous desert environment – the most difficult there is. When a student pilot graduates from Southwest Airsports, he will be able to fly as safely as possible anywhere in the world with confidence. Paragliding training in our beautiful southwest! Paragliding is the closest thing to being a bird that there is. All other aircraft go down from there. No one has any idea what being a bird is like until he flies a paraglider. Below, going cross-country at cloudbase over central Florida. Extreme air sports like paragliding take years of practice to learn to do well. Pilots must be patient! The rewards for diligent and long term effort are, in our opinion, without equal, especially if you learn to thermal well. You will join an elite and tiny group of humans in the world who experience things ONLY the birds can. Want to know first hand what it feels like to exit and enter boundaries in the atmosphere? It's an unseen world that only hang glider and paraglider pilots – and the birds – know. 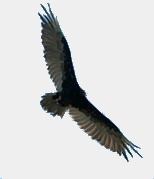 Study the Turkey Vulture and the Albatross – we fumble along compared to these amazing geniuses but their Creator intended them to fly so we can't be too jealous.